We've got some fun, some strange, and some cape-wearing new releases coming this November! Look for these products at your friendly local game store as we draw nearer to the Thanksgiving season. Don't you want Spyke to protect your poker-sized cards? Now he can! Guard your cards from animal attacks and scratches with this high-quality accessory. Each package comes with 50 sleeves. But that's not all Spyke can do. Armed with his Bloody Chainsaw of Dismemberment, a sword, a hammer, and a decidedly evil grin, he's sure to make your foes quiver when they see the card sleeves you've chosen. 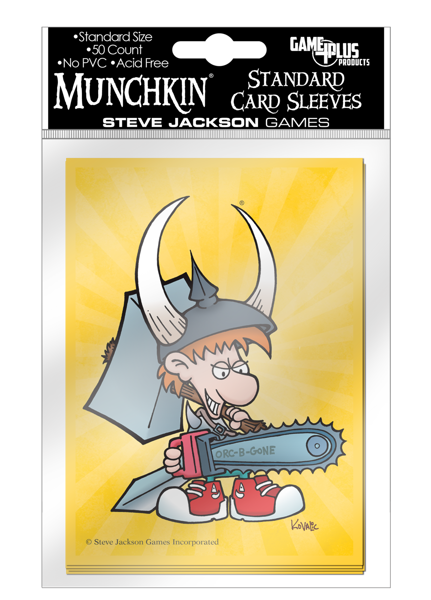 They'll fit on any standard-sized cards – including cards for the upcoming Munchkin Collectible Card Game! A Flower by any other name would be . . . just as terrifying. 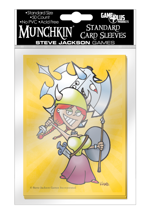 These sleeves, also for poker-sized cards, feature an image of Flower armed with her shield, a spear, and her signature Unnatural Axe. 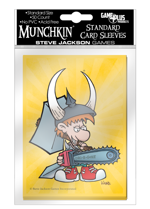 The art is from the original Munchkin illustrator, John Kovalic. Each package comes with 50 sleeves. Buy a mixture of Flower's and Spyke's sleeves to outfit any of your future Munchkin Collectible Card Game decks. The world is round. And also flat. Sir Terry Pratchett created an odd and wonderful world in his 40-plus novels, and he called it the Disc. 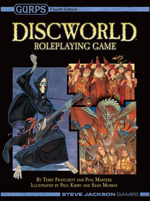 This complete roleplaying game helps players create brand new adventures on the Disc. You can visit settings from Pratchett's novels and meet characters like Rincewind the incompetent wizard, Granny Weatherwax the witch (known to trolls as She Who Must Be Avoided), Captain Carrot the six-foot dwarf, Archchancellor Ridcully, Susan Sto Helit (granddaughter of Death), and a cast of strange and unique characters. Now players can step into this fantastic setting and have adventures of their own. 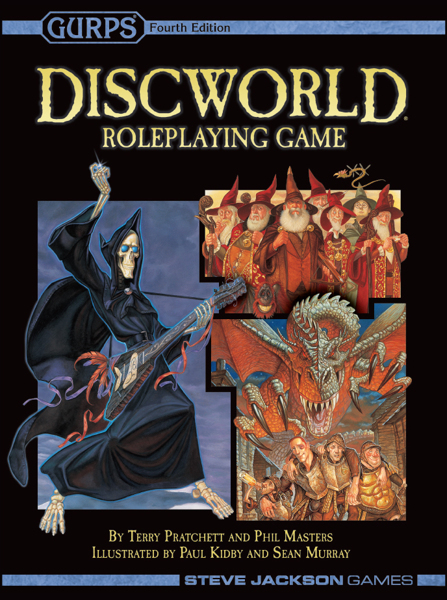 This is the second edition of the Discworld Roleplaying Game. It contains everything from the first edition as well as everything from the supplement GURPS Discworld Also. On the first day of Christmas, my chainsaw slew for me . . . 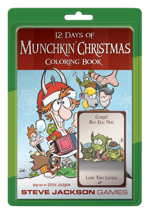 This adult coloring book chronicles the adventures of Spyke during the 12 days of Christmas. And guess what he's up to during that season of warmth and good cheer? That's right! Killing things and collecting treasure. It's got 28 pages of art by Len Peralta, and all of it's ready to color. 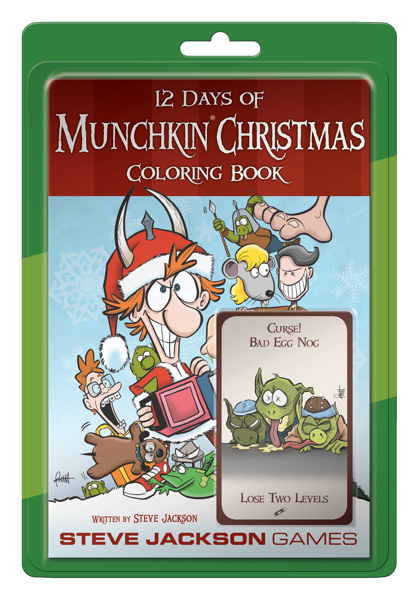 Plus each coloring book comes with 10 new Munchkin cards that shuffle right into any game. You may have plenty of Net Troll cards by now, but what about the Comment Troll? Can you escape the World's Greatest Detective? 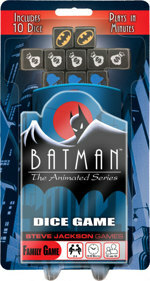 This November, Steve Jackson Games and Cryptozoic Entertainment, in partnership with DC Comics, are publishing a new game based on Batman: The Animated Series. Players take on the roles of the most nefarious villains in Gotham City in this newest member of the One More Roll™ line of press-your-luck dice games, joining Dino Hunt Dice, Trophy Buck, and Zombie Dice. In Batman: The Animated Series Dice Game, Poison Ivy, Catwoman, The Riddler, and The Joker are attempting bank heists all across Gotham City. Assume the role of one of these evil-doers and use your unique power to foil the World's Greatest Detective and escape with the most loot!